On a recent August day at the U.S. Department of Energy’s (DOE) Argonne National Laboratory, 19 seventh and eighth grade girls huddled around computers learning the fundamentals of coding in the Python programming language as part of a two-day “CodeGirls @ Argonne” camp. The coding camp seeks to immerse the girls in computer science before they enter high school. “It’s a shorter version of the computer science coding programs we offer for older students,” said Learning Center Instructor Kelly Sturner. 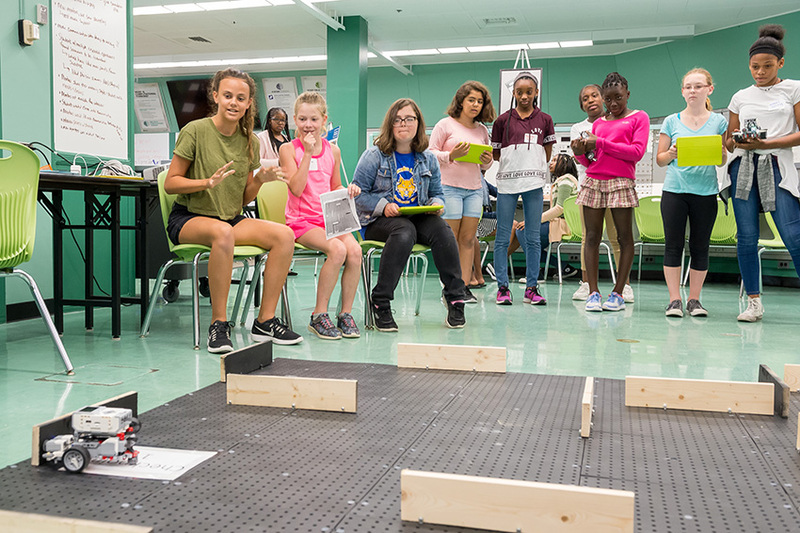 “We started the camp with a challenge to program small battery-powered cars to travel through a maze using a tablet computer, and progressed to a series of projects and games that prepared the students for their final collaborative coding activity to build some simple programs using the Python language,” said Sturner. 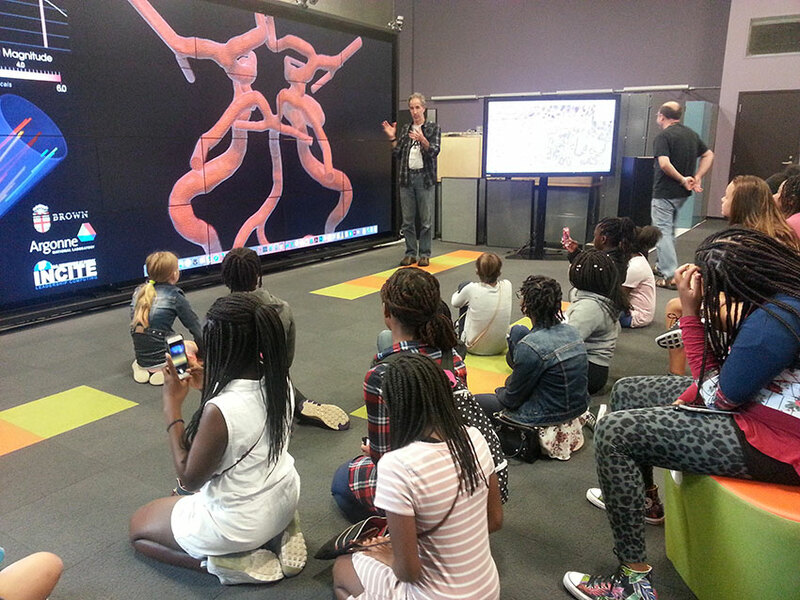 In addition to learning coding fundamentals, the girls interviewed female computer scientists at the laboratory about their work. Questions like “What do you like about your job?”; “Do you work in an office?”; “What made you want to go into this field?” and “What did you study in school?” were among many posed as students and scientists talked. Along with classroom-style sessions and a tour of the Argonne Leadership Computing Facility, students discussed portrayals of women in science and how those influence school and career choices. "I learned what a computer scientist is." "I learned to not overthink coding. If you look at things from a different perspective, it’ll be easier to succeed. My highlight of the day was meeting the pretty cool women who work here." "It was frustrating at times but I really think it made us be the best we could be." The Argonne Leadership Computing Facility is a DOE Office of Science User Facility. 19 seventh and eighth grade girls huddled around computers learning the fundamentals of coding in the Python programming language as part of a two-day CodeGirls @ Argonne camp. Along with classroom-style sessions and a tour of the Argonne Leadership Computing Facility, students discussed portrayals of women in science and how those influence school and career choices. 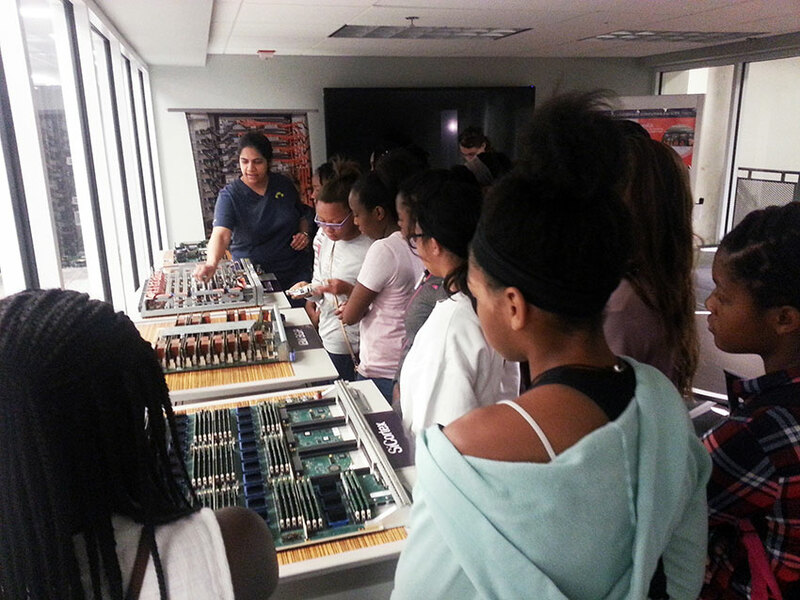 Jini Ramprakash, ALCF Deputy Division Director, and Joe Insley, ALCF Visualization Team Lead, spend time with the girls to explain the importance of supercomputing.